Eric Heatherly Just Did “Somethin’ Stupid” And Got Married | 2911 Enterprises, Inc.
NASHVILLE, Tenn. – Recording artist Eric Heatherly, best known for his rockabilly style of country music with hit songs such as “Swimming In Champagne,” “The Wrong 5 O’Clock,” “The Last Man Committed” and the Top 10 hit, “Flowers On The Wall,” is celebrating the recent marriage to his long time sweetheart and fellow artist Lindsey Stacey. 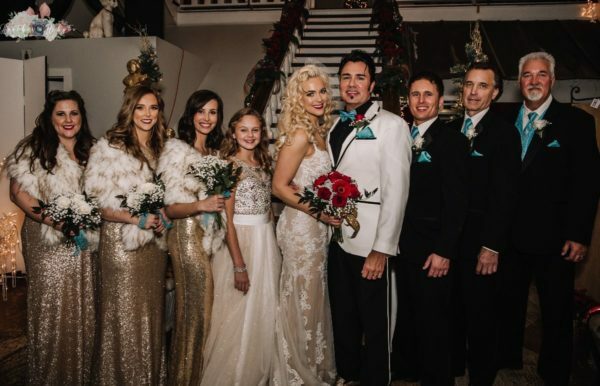 Eric and Lindsey tied the knot on November 24th, 2018 at a private ceremony south of Nashville. To celebrate the occasion, the newlyweds will release a new single together entitled, “Somethin’ Stupid”. It’s a revamped version of the classic #1 song from 1967 by Frank & Nancy Sinatra. Heatherly produced and arranged “Somethin’ Stupid” hoping to give new life to such a classic duet. “It’s a lot more guitar oriented than the original orchestrated version” says Heatherly. “Lindsey and I loved recording this song together. She is an amazing artist and I couldn’t ask for a better duet partner, in music and marriage.” The retro sounding single is set for a world-wide release in honor of Frank Sinatra’s birthday, December, 12th. 2018. It will be released in the U.S. on the NashVegas Recording Co. label solely owned by Heatherly and on the AGR-Universal label in Europe and Asia. Eric is also working on a new album that will be released in 2019 titled, “Matchbook Rendezvous”. The first single will be “The Road Song (Route 66 Revisited)” and will feature a video that was recently filmed in Las Vegas. He describes the full length recording as a five year passion project of vintage sounds laid down on all analog equipment, mostly captured live on 2” tape in his own historic music hall and event center, “The Ole Tennessee Opry”, located just outside of Nashville. When not performing in Branson or doing solo shows, you can catch Eric Heatherly accompanying his good buddy David Lee Murphy on select tour dates with Lynyrd Skynyrd, Toby Keith and Kenny Chesney. DEC 17 – Christmas 4 Kids / Hendersonville, Tenn.
JAN 05 – Opryland Hotel show for UCWDC / Nashville, Tenn.
JUN 02 – Holiday Inn Resort / Panama City Beach, Fla.
Eric Heatherly has celebrated success with hits such as Swimming In Champagne, Wrong Five O’Clock, The Last Man Committed and a Top 10 hit with Flowers On The Wall. Eric is also known for having co-invented and patented, “The Seat-Belt Guitar Strap,” which is the best selling guitar strap in history, distributed by Levy’s Leathers and sold at every Guitar Center in America. In early 2019, with all that design and retail experience under his belt, Eric is launching (with Lindsey) a vintage/vintage inspired online store called, ‘59 Flamingos, where customers can purchase anything from retro UFO turntables, vinyl records, memorabilia, rare and original vintage clothing, instruments and more. Eric & Lindsey have also been busy this year performing in the #1 rated TripAdvisor show, “Raiding The Country Vault” at the Starlite Theatre which earned them a band of the year award from the Brammy Awards in Branson, MO. For more information visit theericheatherly.com or facebook.com/theericheatherly for the latest news, instant downloads, tour info, & cool merchandise.
.@Eric_Heatherly and Lindsey Stacey release new duet #SomethinStupid to celebrate recent marriage.